The Statewide Program of Action to Conserve our Environment (SPACE) is a not-for-profit (501(c)4) coalition of natural resource conservation organizations, agricultural groups, recreational user groups, and concerned landowners and individuals supporting current use. SPACE is New Hampshire's Current Use Coalition. ...for more about SPACE, click here. YOUR DONATIONS ARE GREATLY APPRECIATED! If you have not yet donated , please won't you consider today? Extra funds are needed at this time to publish our next newsletter. If you would like to be excluded from receiving any future mailings, please contact Donna at the SPACE office at 603-224-3306. Thank you for your past support of SPACE, on behalf of Current Use. Your donations help us prepare and participate in each Legislative session for the protection and continuation of the Current Use Law. SPACE remains the primary and most credible advocate of Current Use, since its inception, forty-years on! Your donations provide all with vital studies, timely surveys and Cost of Community Services Studies which show the public benefits of Current Use. We also publish two annual newsletters with a circulation of 35,000, and maintain an office for direct assistance/information for all Current Use landowners and all New Hampshire communities. We hope you will once again consider supporting SPACE! The SPACE first appeal letter for 2013 went out today to our contributors. If you did not receive a copy, won't you please consider becoming an annual contributor? - SPACE CELEBRATES IT'S RUBY JUBLIEE YEAR- 40 YEARS PROTECTING CURRENT USE! We’ve got your back… forty! Whether you own 40, 400 or more acres, you know that Current Use is essential for you to hold onto and manage your lands. Across New Hampshire, in every town and city, over 3.5 million acres of open space – farms, forest and wetlands – is conserved and undeveloped, thanks to Current Use and the stewardship ethic of landowners. Current Use law, now in its fortieth year, ensures that the values of this uncluttered working landscape – scenery, habitats, clean water and air, farm and forest products, recreation – enable New Hampshire to lead “quality of life” ratings across the country.  Lobbying: SPACE maintains a steadfast and ongoing presence to track legislative affairs and any potential changes that might alter or undo the intent, fairness and positive impacts of the Current Use Law. We are fortunate to have Tim O’Connell as a very effective and respected low-key lobbyist. We often collaborate closely with New Hampshire’s other conservation organizations to maximize our resources and credibility. intend to enhance our website – www.nhspace.org – to provide better access and links to all matters Current Use. activities. This enables us to provide a prompt response to all landowner or town queries, keep accurate files, and support the work of the Board of Directors. SPACE must remain diligent on behalf of Current Use, in essence watching “the back forty acres” of thousands of New Hampshire landowners. Each year new challenges arise to our open space taxation law, especially with a new legislature set to meet in January 2013. Each year SPACE faces new and increasing demands; this requires increased annual revenues to continue our mission. Please, continue to help SPACE with your generous donation for this coming year. On behalf of the SPACE Board, I wish you all a healthful and prosperous 2013. Many of you have voiced problems regarding wildlife and how to get rid of them. As a land owner, this reposnisbility is on you to take care of this problem. In NH, the Fish and Game Commission regulates what you can and cannot do with regards to wildlife removal. The best solution in many cases is to trap wildlife and relocate them, versus killing them. There are various other methods to get rid of wildlife. We do recommend that you seek to relocate the animal in a humane way, while still abiding by the law. Hiring a wildlife control operator is always a good practice as any licensed and insured wildlife professional will know the most effective methods to deal with the situation. A professional will know what wildlife animal you are dealing with, where to set the proper traps, and how to safely remove them. NH is full of all types of wildlife like raccoons, deer, squirrels, mice, bats, and skunks to name a few. Depending on the time of year, these animals can seek shelter in your home, barn, or any other building on your property. During the spring to summer time, they usually seek out a safe place to have babies. During the fall to winter, they frequently get into buildings to avoid the cold or store food. LEGISLATIVE UPDATE for 2013 bills that SPACE is currently monitoring:. ANALYSIS: This bill provides that the nonpayment of property taxes on land assessed under current use within 120 days of the due date shall result in the property considered to be changed in use and assessed the land use change tax. SPACE strongly opposes this bill. HB 114 An ACT relatve to abutter access over subdivided land. SPONSOR: Rep. J. Belanger. ANALYSIS: This bill requires a developer to deed an easement to an abutting owner of property with no legal access under specified conditions. ANALYSIS: this bill allows towns and cities to adopt a property tax exemption for farm buildings and structures, including the footprint, actually and exclusively used for farming. SPACE: Monitoring the impact of this bill on current use. ANALYSIS: This bill provides that landowners who permit the use of their land for outdoor recreational activities owe no duty of care to individuals engaged in the recreational activity, including those engaged in the construction of facilities associated with the outdoor activity. SPACE: will monitor this bill. 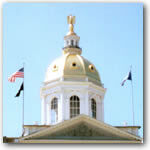 LEGISLATIVE UPDATES FOR 2012: The House and Senate will be on February break (February 27-March 2, 2012). HB 1342: AN ACT prohibiting state and local governments from using funds to employ a lobbyist. HB 1453: AN ACT relative to requiring planning boards to require a deeded right-of-way to a public road as a condition for approval of plans for certain developments. HB 1512-FN: AN ACT relative to the authority of conservation commissions. HB1515: AN ACT relative to the assessment of the land use change tax and the use of the land use change tax revenues. Analysis: This bill changes the tax collection procedures for the current use land use change tax, adds failure to pay property taxes and failure to notify of a qualifying use change to the actions which trigger the land use change tax, and requires all municipal land use change tax revenues to be recognized as general fund revenue. UPDATE: HB 1515 will go into an Executive Session on January 25, 2012 at 11:30 a.m. in LOB Room 301. Please read above for details on how this bill will impact your current use property and local conservation commisions. HB 1540: AN ACT relative to conservation easements on public land. Analysis: This bill prohibits the state or any of its subdivisions from granting a conservation easement on public land to a non-profit organization. HB 1545: AN ACT relative to control of land received or acquired by a conservation commission. Analysis: This bill specifies that conservation commissions do not have the power to convey interests in real property that they receive or acquire. This bill also limits conservation commission contracts to manage interests in real property to a term of 5 years. HB 1586: AN ACT relative to the acquisition of land for conservation purposes. Analysis: This bill requires the selectmen of a town to hold public meetings before the acquisition of land or a lesser interest in land for conservation purposes. HB 1626: AN ACT establishing a committee to study the current use taxation of farm land and farm structures in which utility lines or services are installed. SB 255: AN ACT relative to liens for land use change tax assessments. Analysis: This bill increases the time before the expiration of the lien created by the assessment of a land use change tax under RSA 79-A. SB255 was passed in the Senate on January 25, 2012 by a vote of (5:0). will be heard by House Municipal and County Government Committee on April 10, 2012. SB 337-FN-LOCAL: AN ACT relative to property held for water supply or flood control. Analysis: This bill allows property held by a municipality in another municipality for water supply or flood control to be classified as open space land. SPACE will monitor this bill. It has been recommended to go into an Interim Study. Hearing Date: February 14, 2012 at 1:00 p.m. ANALYSIS: This bill clarifies that land in current use upon which an access road is constructed does not lose its status for current use taxation. SPACE will monitor this bill. HB 1551: Clarifying the liability of landowners, lessees, and occupants of premises who allow other persons to use the premises for hunting, fishing, and other recreational purposes or to remove fuel wood, and relative to the losing claimant's payment of the previaling party's costs in actions against such landowners, lessees, and occupants barred by liability immunity provisions. SPACE will be updating the ongoing status of all the house and senate bills listed above as more becomes known. In an effort to better understand the costs associated with owning and managing forest land the Current Use Board, through the New Hampshire Division of Forests and UNH Cooperative Extension, will be conducting a targeted survey of willing landowners who have taken the time to document management costs. The expectation is to gather this information from a couple of landowners from each county. Consulting Foresters will also be interviewed to further enhance expense data. Forest landowners who have multiple years of data and are interested in participating in the survey should contact Susan Francher, Division of Forests and Lands at 603-271-2214. SPACE's fiscal year for 2012 will end September 30, 2012. As our new (2013)fiscal year begins on October 1, 2012; we will be looking to raise our revenue in order to protect and continuously advocate for Current Use. Our first appeal will be sent out to those of who who have contributed in the past twenty-years sometime in early December. Any contribution received from this appeal will be recorded as your 2012 donation. As always, we appreciate your support and hope we can encourage more of our 35,000 current use landowners to make at least a $50.00 annual contribution. It's simple and easy and helps support and protect your current use land! Go to section ABOUT SPACE (on top left column of this page) and CLICK. From the selections which appear, select ONLINE DONATION. The next screen that appears will only ask you for an amount you would like to contribute. Once you have entered that amount, you will then be transferred over to the SSL-protected eProcessing site to enter your personal credit card information. SPACE does not store any credit card information and SPACE only receives a confirmation sheet from eProcessing when a donation has been cleared. CONGRATULATIONS TO: Toby Barrett of Winchester, NH - he is the winner of the 2012 Summer Kayak raffle. Toby's daughter, Anne Barrett is shown below picking up the family's new kayak at Eastern Mountain Sports (EMS) in Concord, NH. 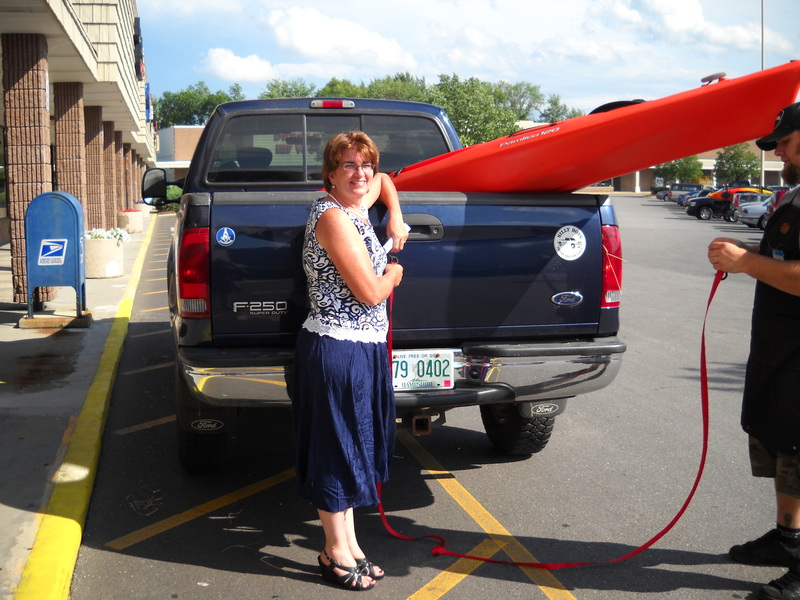 We hope you enjoy your new kayak. Thanks again to all who contributed $100.00 or more during this raffle! CONGRATULATIONS TO Robert C. Potter of Randolph, NH -he is the winner of the Spring Kayak raffle. Seth Potter is shown below picking up his family's new kayak. Have fun! Congratulations to our winner(s): Norman & Marguerite Blouin of Claremont, NH. *The winner(s) are responsible to claim and pick up their prize within (30 days or no later than March 1, 2010) at the SPACE Office at 54 Portsmouth Street in Concord, NH. THANK YOU FOR YOUR CONTINUED SUPPORT AND GOOD LUCK TO ALL! How do I apply for the 20% Recreation Adjustment? Simply fill out application Form A-10 and submit the form to the Town Office by the April 15th deadline. What are the requirements for enrollment in Current Use? A parcel of land that is 10 or more acres in size and is farm, forest or unproductive land. There are a few exceptions to this requirement. Isn't it true that all Current Use land is open to the public? No. There is no requirement for Current Use landowners to allow public use of their land. Current Use land is private property and the landowner has the right to decide how their property is used. ...for answers to more Frequently Asked Questions, click here. For you convenience, please download individual NH Town tax rates 2000-2009, download here. Site design by Web Parlour Design | Site management by SPACE | © 2006 SPACE All Rights Reserved.